Property Size 1,443 sq. ft.
Are you ready for the most fabulous family vacation ever? We are in the process of buying new furniture, refinishing the pool deck, selecting paint colors and choosing just the right granite counterop and stainless steel appliances for the kitchen. If you want to stay in a beautiful, totally refurbished vacation home that backs up to a gorgeous Florida lake, reserve now before we put up the new photographs and the home completely fills up. If you have any questions about it, just give us a call. 3 Bedroom/2 Bathroom Home with Private Screened Pool, Lake View, Conservation View, Pet Friendly, Master Suite, King Bed, Soaking Tub, Washer/Dryer, Fully Equipped Kitchen, Free Wireless Internet, Expanded Cable, Right Beside Disney. All homes are licensed by the State of Florida and equipped with smoke detectors, fire extinguishers, and pool safety alarms. We are long time members of the Better Business Bureau, Central Florida Vacation Rental Manager's Association, Central Florida CVB, Kissimmee CVB, Orlando/Orange County CVB, and Visit Florida. A Disney Exit is only 7.8 miles away. Sea World, Universal, and the Convention Center are approx. 15 minutes beyond that. We have had a wonderful stay . The house is well equipped and in an ideal position for both shopping and all the theme parks (maximum 30 minutes). In addition, at the back of the house there was a fantastic display every day from the animals along shingle creek, including ; Gators, turtles, egrets, cormorants and a pair of golden eagles, so remember your binoculars. House was in very good condition and located in a nice, quiet neighborhood. We enjoyed looking out over the pond and watching all the birds. The super Walmart at the end of the road was very convenient, along with the nearby restaurants and Wawa gas station. The owner was understanding and accommodating as well. Lovely villa in great location we will return. "We had a wonderful time . The weather was great and the house is situated in a very convenient spot just off the 192. The shops are just minutes away and the theme parks are within 20 minutes . There is a small public park within 10 minutes walk which has a nature preserve and childrens play area . 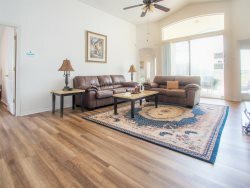 The close proximity to both the executive airport and Police firing range does mean that, on occasions , there is noise from both of these facilities, but it does not detract from the lovely view of the lake and wildlife , which can be seen from the lanai. The heated pool was wonderful and was used regularly , even in mid-winter. We enjoyed our stay so much we have already booked for next year. " The location was close to everything. The house was amazing and we were provided with plenty of towels, linens and kitchen/dining utensils. The only thing I wish we were provided with was paper towels, toilet paper and trash bags. Other then that, our stay was great. We stayed in the villa for 11 nights and were delighted with the experience. It was close to all the parks, restaurants and shopping. The villa itself was spotlessly clean and had all the amenities that we required. We did not require the assistance of Florida Dream Homes but felt that they would be in a position to assist if we required anything. There was lots of information left within the villa which assisted us during our stay. We would definitely recommend Florida Dream Homes and the villa that we stayed in. We stayed at 258 Old Mill Circle and it was lovely. It was lovely and clean and well Presented when we arrived. The entry codes worked well. We will certainly consider Booking it ,or 260 ,for next year. Many thanks for your help when the pool heater stopped working. You and Chris were most helpful. 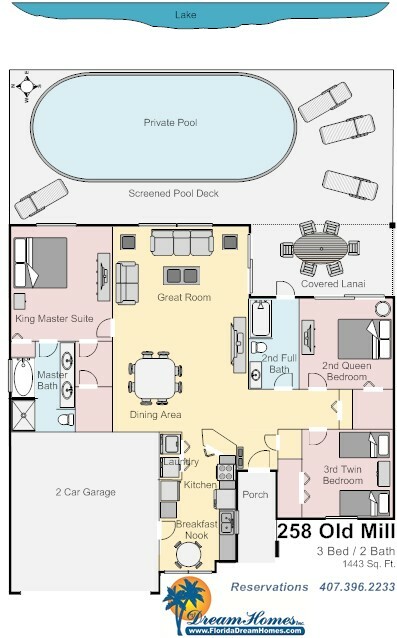 This floor plan is our best guess of how the home will look when the remodeling is completed. Reserve now. Once we put up the photos of the completed home, it will sell out quickly!